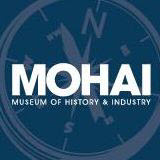 The MOHAI is a lovely facility located at the South End of Lake Union. It features the history and stories of the people that have developed this region. The museum hosts a number of special events, classes, and activities in addition to its everyday exhibits.